Loper OS » “Rodenticide” with the Seiko DPU414 Tape Printer. Non-editable and non-erasable system logs. Observe that the enemy does not need to know that a log printer is in use. Let him wonder. But naturally you will want to keep the output brief enough to read and compare with the contents of electronic logs, with some regularity. AKA Vernam cipher. This should need no explanation; OTP is part of an ordinarily educated computer user’s essential toolkit. Observe that you can print duplicate “pads” without ever storing a pad on a computer for any length of time, by simply connecting two or more tape printers using a fan-out cable (AFAIK no such thing is sold anywhere, but you can trivially make such a cable yourself in a couple of minutes) to your RNG. 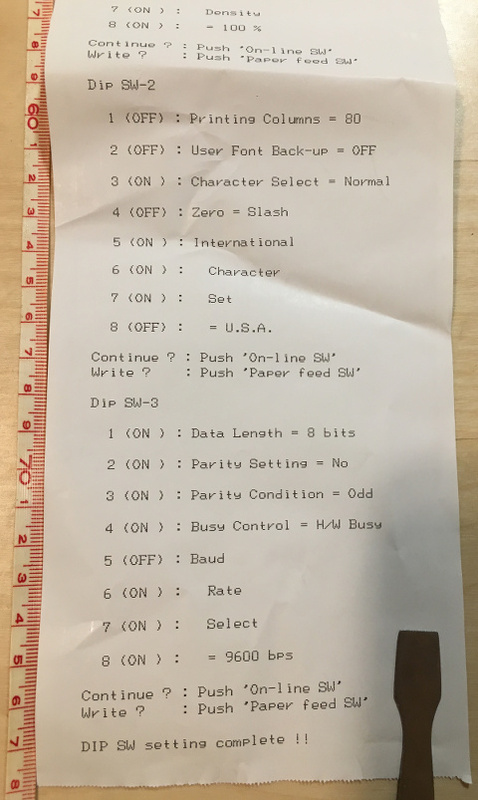 This printer can be configured to emit 80 columns of text (Alternatively, 40, with larger characters.) AFAIK it is the only thermal printer on the market which can print 80 columns. If anyone knows otherwise, I would like to hear about it. Fortunately, this only has to be done once. If one believes the manual, the Seiko 414 also knows how to print graphics (monochrome, 640 pixels wide, times… well, “infinity”-high…) and can therefore print “QR” codes (for, e.g., Bitcoinism) and similar applications. But I have not tried this. And this is where I note that I have no particular love for Seiko, and will ask any among my readers who might know of a similar-but-cheaper printer; or of one that can print on a wider thermal tape; or even of an entirely different but somehow superior tool for the same job — to please write in. This entry was written by Stanislav , posted on Wednesday January 17 2018 , filed under Bitcoin, Computation, Cryptography, Hardware, Hot Air, NonLoper, Photo, SoftwareSucks . Bookmark the permalink . Post a comment below or leave a trackback: Trackback URL. The manufacturer appears to have gone out of business. But otherwise it seems to be a similar item to the Seiko. 33 xor 120 = ?